When it’s time to update that bathroom with poor lighting and less-than-desirable bathroom fixtures, let ProSource® of Rochester help with the remodel. Between your ideas and our products, we can turn your client’s bathroom into an in-home spa they’ll want to spend time in. And, as always, our products will be of the highest quality while still offering you a low wholesale price. Bathroom sinks are for more than washing hands and brushing teeth. 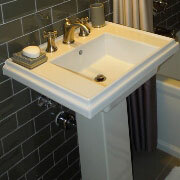 A unique bathroom sink can tie the space together and act as an anchor. Our pedestal, wading pool, or vessel sinks should all do the trick. 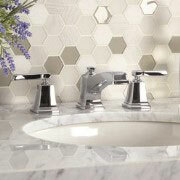 Though they may be a more minor bathroom fixture, bathroom faucets will complete the look of your sink. We have traditional and modern styles, along with everything in between. Come to us for cross, knob, and lever handles to match your sink. No bathroom remodel is complete without a revamping of the shower. 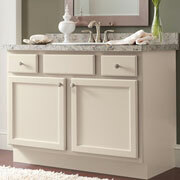 Old shower doors and leaky faucets shouldn’t have a place in a state-of-the-art bathroom. Complete the transformation with a shower remodel that will have your client relaxing. Bathroom vanities aren’t just for looks; they encompass everything from storage to counter space to lights, mirrors, and more. If not carefully chosen, they’ll often look overwhelming in a bathroom. Let us help in making sure your client gets the right size and style. When your client is ready to relax in a tub at the end of the day, old jacuzzi jets won’t do the trick. 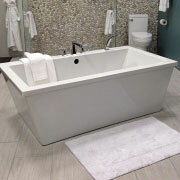 Do a bathtub remodel with our jacuzzi tubs, shower-tub combos, or statement tubs with claw feet. 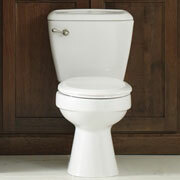 A new toilet is surprisingly refreshing, so don’t neglect this throne when it comes to a bathroom remodel. We can help decipher which flush rating, flush mechanism, and bowl size will work best for your client.